Alexander Noel really enjoyed this article by Adrian Clark. This is for all of those very sharp mature men that are about to hit 50. Take a look! Speaking from personal experience, 2017 was a challenging year. It was bookended by two major events that would change my world for ever. In January I turned 50 (for those who have yet to hit the half-century milestone, let me clarify one thing: age is not just a number) and in December, having been a Londoner for more than 30 years, I moved to the Kent coast in pursuit of a more rewarding and peaceful existence. OK, so at first glance you may well say the two are obviously intrinsically linked. Fair enough. As we get older, we all hanker after a slower pace of life, right? Correct. But the collision of these two events opened a can of worms that I, for one, didn’t see coming. It was time to downsize and, in the interests of both age-appropriateness and to avoid having to book an even bigger removal truck, to edit my out-of-control wardrobe. Working as a fashion editor for more than three decades comes with a whole lot of baggage, quite literally. There is a never-ending pressure to keep up with trends. And it comes at a price if, like me, you are a hoarder – and, in my experience, most men are. After four days dividing up my spoils into “action” piles – one to keep, one for charity, one to re-home, one to sell on eBay – it became clear to me that 50 was not the new 40. It was, traumatically, the finishing line for half of what I owned and, if I am brutally honest, was still wearing. Crossing over to the wrong side of a half-centenary turns out to be a pivotal junction: you are forced to make decisions on what you should not, as opposed to should, be wearing. A lot of men entering their 50s fall into one of two camps (with a minority bridging the divide): those who have given up, and those who don’t know when to give it up, with the old me falling uncomfortably into the latter. I get that now. First to hit the deck were my combat trousers, which seem to breed if left alone in a dark closet. I lived in combats through the 1990s and 2000s, quietly phasing them out and only giving them the odd guest appearance in recent years. In fact, any trousers that are oversized, have too many pockets or zips, or have too much surface decoration are a definite no-no. And while we are on the subject of wardrobe staples that have a military heritage, anything in camouflage print also needs to bow out gracefully. 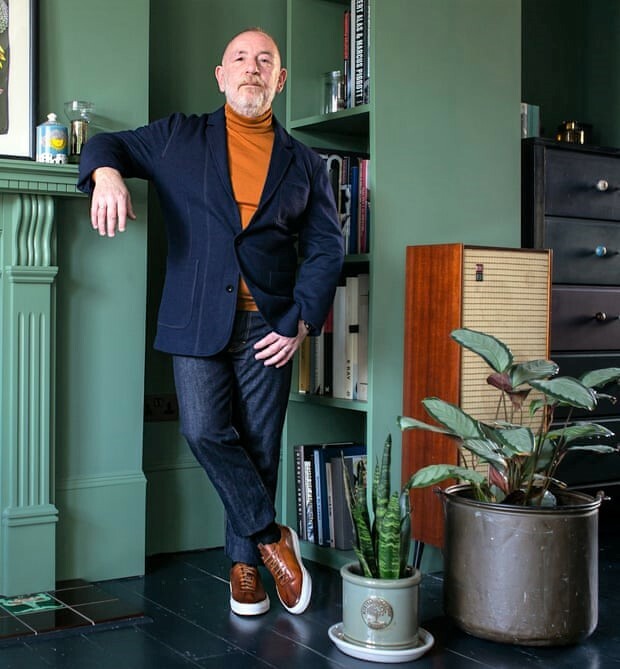 My advice is to keep things in the trouser department plain and simple, with a casual/formal edge – that’s fashion speak for more laidback than a suit trouser but more presentable than a pyjama. I am thinking here of a classic jean cut made in a luxury fabric, as opposed to denim, or a chino that has a careworn vibe, and isn’t too box-fresh or preppy. 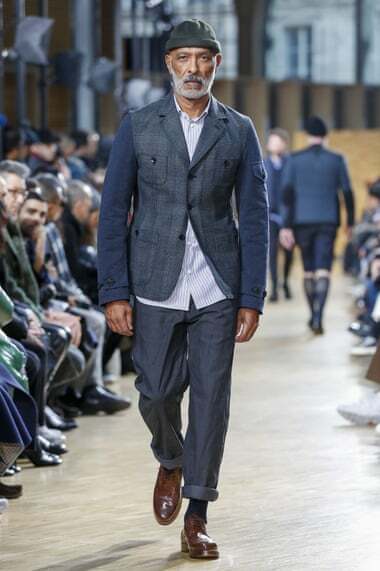 Margaret Howell makes a mean trouser (a washed cotton twill chino will set you back about £165) as does the Swedish high-street mecca for basics, Arket, whose trouser offering ranges from £55 to £90 (I’m a big fan of their relaxed hopsack slacks). A philosophy to adopt across your entire wardrobe is that less is more (both stylistically and in terms of quantity). Now that the time to follow trends has thankfully come to an end, it is better to have a select number of investment items that cost a bit more and will last longer than a landfill of cheaper alternatives. Another mistake men make is to hold on to things for decades, in the belief they will come back into fashion. In theory that is true – we are having a bit of a 90s revival as we speak. But note to self: these revivals are intended for a younger generation. The bucket hats, anoraks and fleece track-tops that currently look great on kids should be given a wide berth. You won’t give off the vibe of a man with their finger on the pulse – you will simply look like that guy who got stuck in the Britpop era. Baseball caps (I’m just going to say one thing… Forrest Gump), skinny jeans, parkas and Hawaiian shirts are all also on the “to ditch” list. Channel your inner Richard Burton instead and make friends with rollneck knits, Harrington-style jackets (Oliver Spencer is the master of these), pea coats and softly constructed tweed coats. Private White VC is a brand that knows how to make the latter properly. Comfort is important but doesn’t mean hitting the default switch and wearing age-inappropriate sportswear or, even worse, looking like you have given up on fashion altogether. Another age-inappropriate alert: anything on an e-commerce website prefixed with the word “Dad” – such as Dad trainers or Dad jeans (cue Balenciaga) – isn’t a green light for you to get the credit card out. The word is used ironically, to describe something your dad would have worn, and should be avoided. The impression you should be giving is a man of the world who has lived and made intelligent and experienced choices: a man who doesn’t need to jump on to every bandwagon, but is in control, happy with his lot, and confident. Moving to the coast was my choice, turning 50 was inevitable – but at least, wardrobe edit in the bag, I can control how stylishly I decide to live it.